Must-Have Holiday Item! 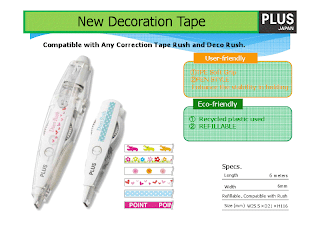 Glue Tape and Decoration Tape from Plus Corporation! Plus Corporation is an amazing company because of their innovative ideas on how to make life just a little bit more fun and easier. I’m sure everyone can agree that nothing is worse that dealing with tape while wrapping Birthday, Shower, or Holiday presents, it either gets stuck to itself or is impossible to tear because your fingers are busy holding down the wrapping paper. 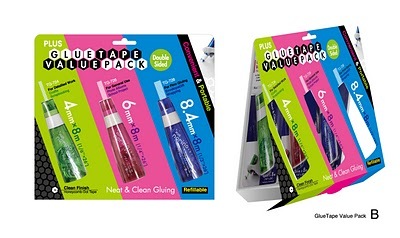 Glue Tape is double sided glue that is in the form of tape. It is basically a very neat and clean way to be creative and make something really stick! It’s perfect for wrapping gifts, scrapbooking, school projects, presentations, and more, giving you a professional look! The value packs above feature 3 different Glue Tape Size Options, to ensure the right dimensions for your project. A 4mm size for “Detailed Use’ in smaller crafts and scrapbooking projects, a 6mm size for “General Use” in photo albums and school projects, and a 8mm size for “Firm Gluing” of envelopes, gift wrapping, etc. These value packs are a hot product for the Holiday season as well as throughout the year. The Decoration Tape is pure fun. It is a pen-like dispenser that applies fun designs and patterns in the form of tape. This multi-applicator can also be used with the correction tape refills, making it useful for both business and pleasure. This is the perfect item for those who enjoy adding some personality to their notes or projects and it is also made with Recycled plastic. By combining innovation and style in all of their stationery and security products, Plus Corporation has become one of the top stationery companies in the world. Not only are their products modern and inventive, they are super afforable. COMING SOON TO YOUR LOCAL BED BATH AND BEYOND STORE! >The New Staple-Less Stapler and Decoration Tape from Plus Corporation! In addition to the ID Guard Series from Plus Corporation, Dream Products is excited to announce the two newest products Plus is bringing to market. They are introducing the innovative Staple-less Stapler and Decoration Tape, doing what they do best which is to make our lives just a little bit easier. 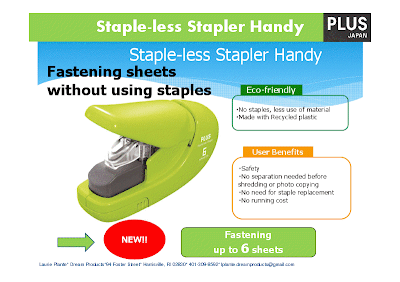 The main selling points for the Staple-less Stapler are the fact that it is Safe, Secure, and Eco-Friendly. There’s absolutely no staples, meaning less use of material, no running costs to buy staples, and no encounters with sharp staples. It is also made with Recycled plastic, and can staple up to 6 pages at a time!